The CETIE-UVa is a transdisciplinary research center in education formed by 70 researchers coming from complementary fields such as Psychology, Pedagogy, Science education, Math Education, Art Education, and Special Education. Its main research areas have to do with the integration of Information and Communication Technologies in the curriculum, resilience issues, and autism disorders. 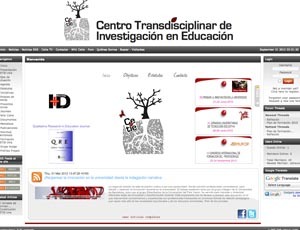 Please provide a list of faculty and students active in Qualitative Research: Iván M. Jorrín Abellán, Bartolomé Rubia Avi, Rocío Amguita Martínez, Sara García Sastre, Sara L. Villagrá Sobrino, Henar Rodríguez Navarro, Alfonso García Monge, Inés Ruiz Requies, Eva Mª Fernández Faundez, Estefanía Arribas, Álvaro García, Quico Arribas.